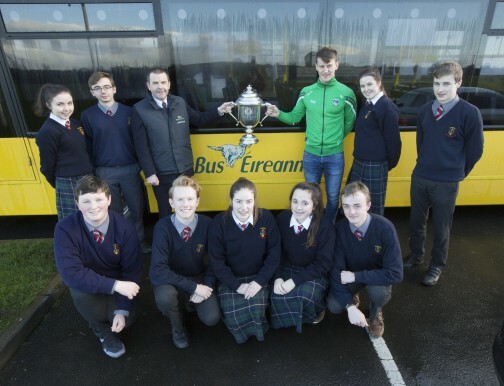 Limerick hurling star Tom Morrissey and Limerick’s under 21’s Hurling Manager, Pat Donnelly visited St John the Baptist Community School in Hospital, Co Limerick to promote the Bus Éireann competition for transition year students – ‘Go Places’. The March 16th deadline for entries to the competition is now fast approaching and with just seven weeks to go, the Limerick GAA stalwarts are encouraging Transition Year students to enter. Bus Éireann has operated the School Transport Scheme on behalf of the Department of Education and Skills for 50 years. Every day in Limerick, it transports 12,621 pupils to and from school on 526 buses under the scheme. That breaks down into 85,326kms each day on 760 school routes.